Our Ranch Store and Visitor Center provides both an informative display of ostrich husbandry as well as many unique ostrich related collectibles and gifts. Edible eggs and Ostrich Meat can be purchased from our refrigerated department for shipment anywhere in the U.S. Check out our Ostrich Meat Department for more information on our own USDA-inspected Blue Feather brand. Empty ostrich eggs or shells are utilized as a diverse artistic medium ranging from jewelry boxes and purses to canvasses and light fixtures. Due to its distinct characteristics and unique appearance, ostrich egg art has become a prized possession to collectors all over the world. Picturesque landscapes and primitive illustrations are but a few possibilities artists use to depict life in art. We also carry unique earrings carved from fragments of hatched shells by local artisans. 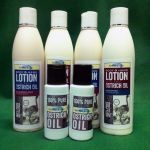 When it comes to Ostrich Oil and Lotions, we feature our own BLUE FEATHER brand of products. Our Blue Feather Ostrich oils and lotions are 100% made in the USA and are FDA compliant. 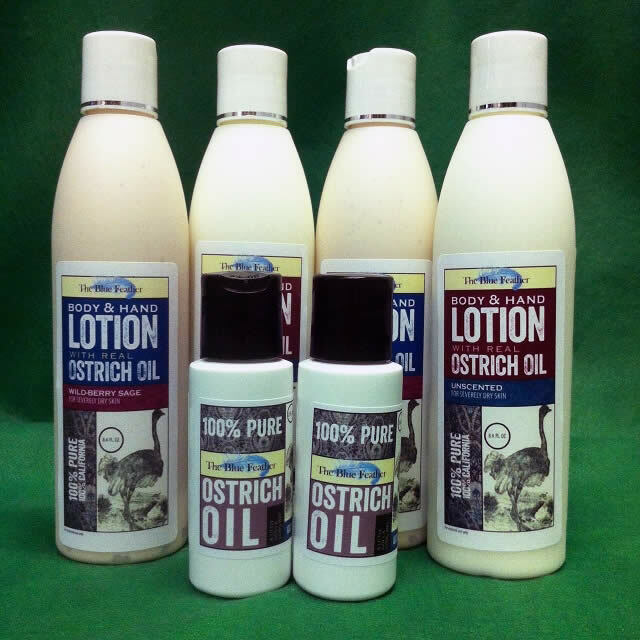 Visit OstrichOil.info for detailed information about Ostrich Oil. Ostrich Oil and it’s derivatives including lotion, soap, and lip balm are increasingly popular due to their natural healing properties. References to the benefits of ostrich oil were documented as far back as the first century A.D. Since then, people all over the world have been using ostrich oil to sooth dry chapped skin, relieve eczema, and calm irritated burns. Because of it’s high concentrate of healing Omega Fatty Acids, the oil has been known to improve the appearance of fine lines and wrinkles and soften cracked heels. Ostrich oil is quick absorbing and provides luxurious moisture for hours. One woman pledges it alleviates her unwanted calluses and purchases several bottles from us at a time. There is no end to the myriad of possibilities when using this exceptional product. Try some of our wonderful oils and lotions today! *No scientific claims are being made as the research to substantiate these claims is not available. 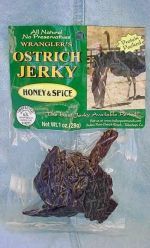 Then check out our own USDA inspected WRANGLER brand Ostrich Jerky that’s high in protein, low in fat and beats the typical store bought protein bar hands down. This best selling brand Ostrich Jerky really delivers the good stuff and the taste as well.